LocScale is a reference-based local amplitude scaling tool using prior model information to improve contrast of cryo-EM density maps. It can be used as an alternative to other commonly used map sharpening methods. 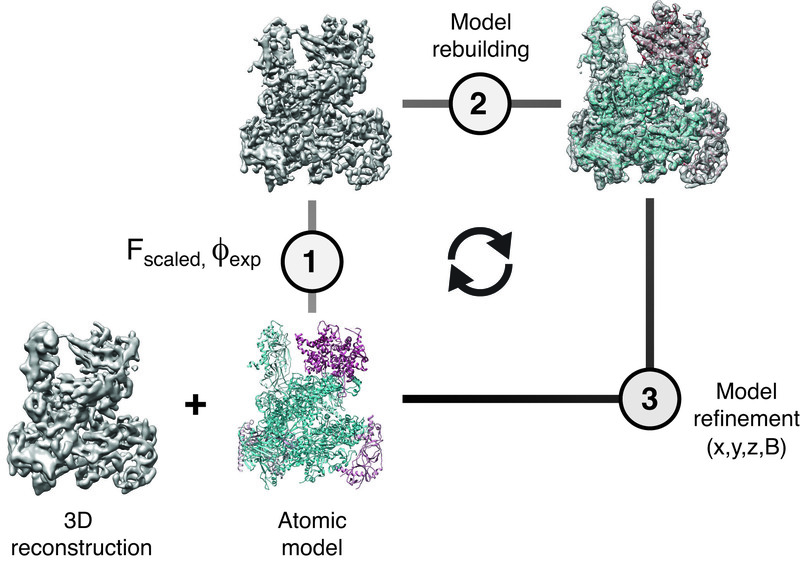 To reliably reflect the required level of local sharpening and local resolution variation in the target map, atomic B-factors of the reference model should have been refined using appropriate protocols prior to scaling. It is also possible to use LocScale for local sharpening without a model in cases where an atomic model is not available. The method is described in more detail here . LocScale is written in Python and in part based on libraries from EMAN2/SPARX and CCTBX. LocScale is dependent on NumPy and SciPy and mpi4py. To run on multiple CPUs in parallel, LocScale uses MPI for distributed-memory parallelisation. Execution of the MPI-parallelized version requires installation of an MPI implementation (e.g. openMPI) on your system. LocScale needs mpi4py to interface with the MPI implementation Please check with your system administrator or see here for details how to set up mpi4py in your environment. The program and associated utils are available [here] (https://git.embl.de/jakobi/LocScale/tree/master/download) for download.